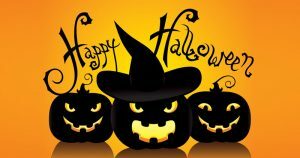 We hope you have a Safe, Fun and maybe even a little Scary Halloween!! While you are out Trick or Treating please make sure you watch out for vehicles because they may not see you in the night. It helps to have glow sticks or something reflective on you or even a flashlight hanging at your side. To be the safest only go to houses you know but still have an adult double check your candy before you eat any.